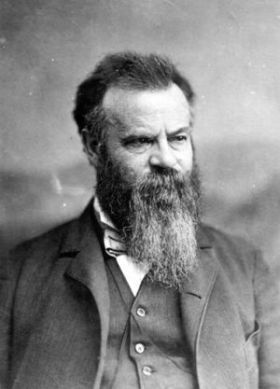 Below are more quotes by John Wesley Powell. The elements that unite to make the Grand Canyon the most sublime spectacle in nature are multifarious and exceedingly diverse. We are now ready to start on our way down the Great Unknown. Our boats...are chafing each other, as they are tossed by the fretful river. We have but a months rations remaining. The flour has been resisted through the mosquito-net sieve; the spoiled bacon has been dried...the sugar has all melted and gone on its way down the river. We are three quarters of a mile in the depths of the earth, and the great river shrinks into insignificance, as it dashes its angry waves agains the walls and cliffs, that rise to the world above; they are but puny ripples, and we are but pygmies, running up and down the sands, or lost among the boulders. We have an unknown distance yet to run; an unknown river yet to explore. What falls there are, we know not; what rocks beset the channel, we know not; what walls rise over the river, we know not. I am not sure that we can climb out of the canyon here, and, when at the top of the wall, I know enough of the country to be certain that it is a desert of rock and sand. I almost conclude to leave the river. But for years I have been contemplating this trip. To leave the exploration unfinished, to say that there is a part of the canon which I cannot explore, having already almost accomplished it, is more than I am willing to acknowledge, and I determine to go on. The landscape everywhere, away from the river, is of rock, cliffs of rock, tables of rock, plateaus of rock, terraces of rock, crags of rock, ten thousand strangely carved forms...cathedral shaped buttes, towering hundreds or thousands of feet, cliffs that cannot be scaled, and canyon walls that shrink the river into insignificance, with vast hollow domes and tall pinnacles and shafts set on the verge overhead; and all highly colored.